There is a place around KL where you can see Rhinoceros Hornbills flying free, and no, I am NOT talking about the KL Bird Park. This place is the little known Ampang Forest Reserve or better known locally as Taman Rimba Ampang. Located about 10km from KLCC, the Ampang Forest Reserve is popular with locals who go for a dip in the shallow river that runs along the road that leads to a water treatment plant. 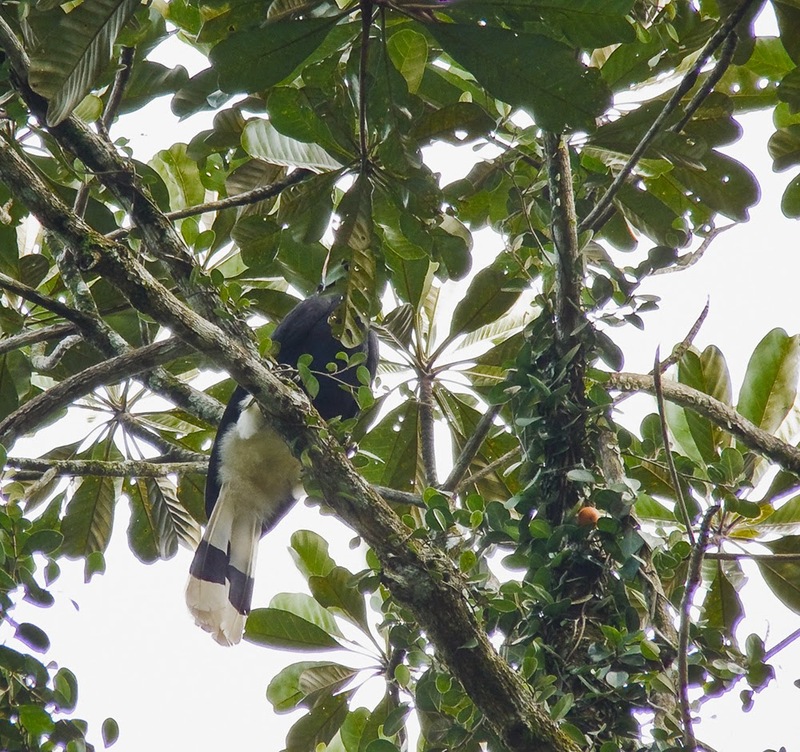 Rhinoceros Hornbill (Buceros rhinoceros) at Ampang Forest Reserve. The dark eyes (reddish in colour) tells me it is a boy. His partner flew to another portion of the canopy that was obscured from my view. The upturned, yellow-red casque, black neck and face and a horizontal black stripe in the mid-section of the tail is diagnostic of this species. 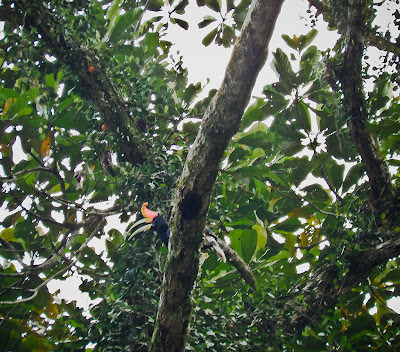 This bird was going after the two orange-red fruits dangling above. Rhinoceros Hornbills (Buceros rhinoceros) is one of the largest Asiatic hornbills, with a body approximately the size of a swan and have the usual pied body color i.e. black and white. 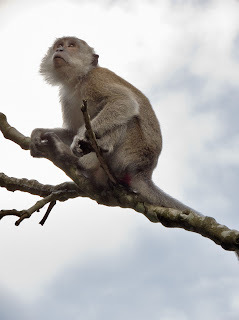 They are found from the south of Thailand down through to the Malay Peninsula, in Sumatra and also in Borneo. Many would have heard their calls before, but fail to realise that it was a hornbill for they sound more like the noise a mammal would make. Hence, when you visit this forest reserve, do keep an ear out for the calls of the hornbills. You can, for most of the time, hear their calls from the forest to the left of the river (after the river passes under the road, the same side as a small surau). 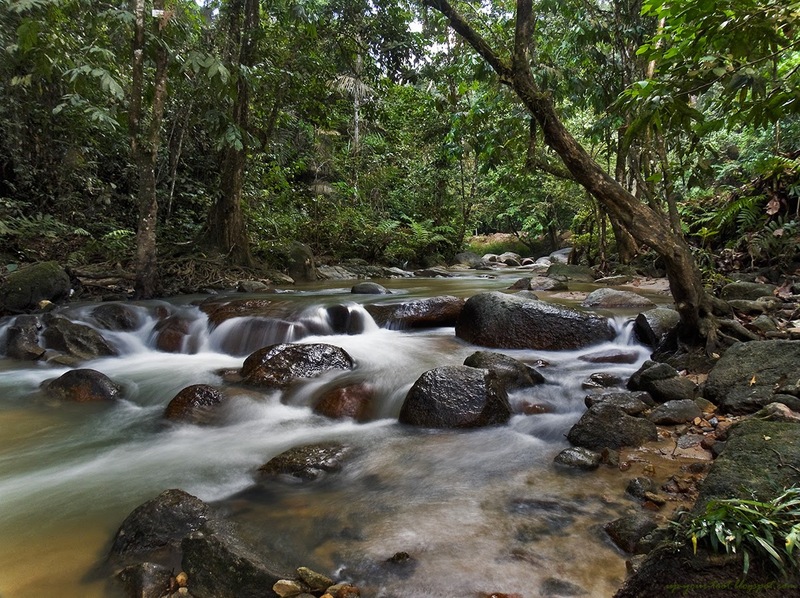 The beautiful stream/shallow river at the forest reserve. I heard the hornbills calling, but as I was doing long exposures, I wouldn't have enough time to reposition and shoot the hornbills. At the end of the road is a water treatment plant, that has been operational since the British colonial rule. This water treatment plant draws water from the catchment area in the surrounding hills. The trees around the entrance of this water treatment plant are good spots to catch a glimpse of the Rhinoceros hornbill. They can be clearly seen when they drop by the tree tops by the road to feed on the climbing figs that grow there, which appear to be Ficus punctata, another root climbing fig of the subgenus Synoecia (like Ficus pumila and Ficus villosa), with golf-ball sized fruits. So do familiarise yourself with their calls and 'barks' that can help you pinpoint their location. Peekaboo, I see you. The male Rhinoceros Hornbill browsing for figs. 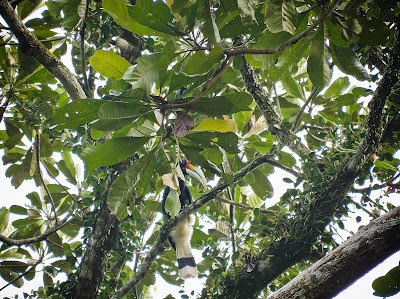 He is very good at picking the fruits and sort of flipping it down its beak. The black, horizontal band on the tail of the Rhinoceros Hornbill. 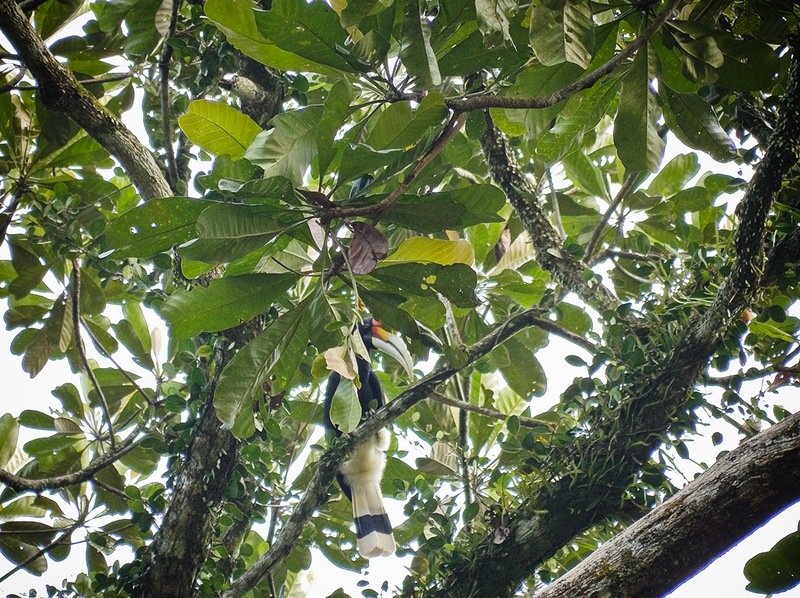 The orange ball to the right of the bird is the fruit of a climbing fig, most likely Ficus punctata syn. Ficus aurantiaca. Ficus aurantiaca is an illegitimate name for this fig. The Ampang Forest Reserve is however, doomed to suffer future degradation. Middle of 2013, the KL Outer Ring Road (KLORR) project was approved after the EIA was passed (it was rejected twice), and the highway will cut and fragment the forest reserve. Worst still, the Ampang exit for the KLORR highway will run by the side of the river, the area where I could hear the hornbills calling from! Sadly, we seemed to have a strange concept of solving problems and an even stranger government where water shortage is an issue and yet catchment area forests are allowed to be encroached upon. Then come up with strange water transfer projects that disturbs the environment further. The guardian of the forest reserve. Long-tailed macaques were feeding on wild figs (Ficus hispida) growing along the side of the road. 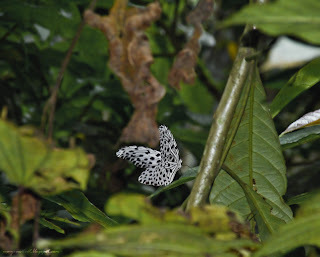 A Tree Nymph butterfly (not to sure which one - the wingspan is pretty large and hind wings rather pointed as seen in the picture). It was taking short flights around a small patch of undergrowth. They are pretty interesting to watch, especially when flying/gliding down the a clearing. The Malay name for the tree nymph butterflies is surat, meaning letter. There has been attempts to highlight the issue of the forest reserve and to stop the highway, which was supposed to be part of the Taman Warisan Negeri Selangor. Hopefully something good comes out of it. If that fails, do go and have a look at Ampang Forest Reserve and the magnificent Rhinoceros Hornbills before its too late. They might not hang around so close to the city once the highway construction starts. To get to the forest reserve, drive along Jalan Ampang towards the hills and keep on driving (keep going past Ampang Point and past Ampang Waterfront) until you reach the end of the road. There is an arch with the name of the forest reserve and a public parking spot on your right. You can park here or drive further in where there are smaller car parks. My advice is to park outside and walk in. This will help cut down the noise and air pollution. Cantik gambar river flowing you ambik cam kat magazine. Dulu sometime the hornbill do come and visit our backyard. Have not visit us for such a long time. Thanks, letak tripod, guna long exposure. Mungkin tak ada buah yang tengah masak. Kalau pokok ara liar ada buah yang dah masak, keep an eye out.